Nothing will stop Nigerians from aiming for America, writes novelist Adaobi Tricia Nwaubani. Not even the recent travel advisory by a special adviser to President Muhammadu Buhari urging Nigerians with valid US visas to postpone their trips there. 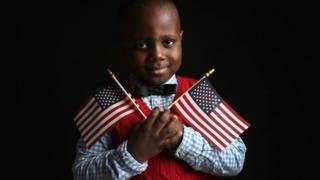 To many Nigerians, America is the Promised Land. A land where clear waters gush and trees flourish with fresh dollar notes, where bees lose their sting and pigs fly. A land where lame feet are cured and blind eyes are opened, where African accents shed their dense tones and become shrill nasal emissions filled with "R"s and "wanna" and "gonna". In America, lizards transform into crocodiles. Are you the class dunce? The black sheep of the family? A notorious ne'er do well? Never mind. America will soon change your story. And the next time you visit Nigeria, your entire village will gather to receive you at the airport. America is also the insurance for a child's future. Many Nigerian couples do not mind borrowing funds to travel and have their babies there, so that the children are instantly issued with the red booklet that is their passport to a better tomorrow far away from Nigeria. Let's not forget the shopping. America has some of the best goods and experiences that capitalism has to offer. Nigerians who have it need somewhere to spend their money. So what if President Buhari's special adviser is right and some Nigerians with valid visas have been denied access to Donald Trump's America? Thanks for letting us know. Very kind of you, indeed. We shall simply add the US border officials to the list of principalities and powers that have to be defeated as we journey to this Promised Land, right next to the US Embassy officials that we have been battling with and overcoming for decades. Many Nigerians narrate their conquests at US Embassy interviews in a manner that must be similar to how David recalled his slaying of Goliath. "Many Nigerians narrate their conquests at US Embassy interviews in a manner that must be similar to how David recalled his slaying of Goliath." "The woman was looking at me," they say. "I looked back at her. She didn't even look at my documents. I kept staring at her. I didn't remove my eyes. Then, she did her face as if she was about to deny me the visa. Under my breath, I just prayed and asked God to take full control. "In my spirit, I already knew that the victory was mine. Suddenly, she frowned and said I should come back for my visa. She didn't even know what came over her. God just took control and turned her heart in my favour." But don't be fooled by how easy it all sounds. These conquests - whether for a visitor, student, immigrant or any other kind of US visa - are usually preceded by natural and spiritual preparations. On the natural side, there are men and women, "agents", who have gained a reputation for their US visa application expertise. Some are consultants, selling advice on what and what not to say in order to nail your interview. Some assist with the application process. "If this man helps you fill your application form," people say, "there is no way they can refuse you a visa. He knows exactly what you should write." On the spiritual side, preparations for a US visa interview sometimes include periods of fasting and praying, or visits to spiritual experts who will command invisible forces in the unseen realm to yank open the doors of America before you. For, until these gates of brass have been unlocked spiritually, they say, you may attend a billion interviews and fail. The embassy officials are merely succumbing to forces beyond their control. While visiting Edo State in southern Nigeria last year, I met a friendly juju priest, known in his community as "Doctor", who claimed that his specialty was ensuring girls taken to Italy for prostitution did not run away without repaying the debts owed to the brokers, the madams, who paid their way to Europe. He also told me that he assists men to smuggle cocaine successfully through international borders. "I tell them on what exact day they should travel," he said. "If they follow my instructions, they will never get caught. On that day, nobody will be able to see whatever it is they are smuggling through." His spiritual powers purportedly blind the most advanced detectors. If the rumours of Nigerians being turned back at US borders are true, I imagine that Doctor's services will soon extend to "seeing" and "telling" the exact date one should travel to America, the day when the border officials will be spiritually hypnotised into saying "Welcome to America" with hardly a glance at your visa or passport. Rather than adhering to any travel advisory, many Nigerians would simply extend their unorthodox efforts, not just to conquering a US Embassy interview, but to crossing border control successfully. For nothing, not even President Trump, can stand between a Nigerian and his or her quest for a better life. Letter from Africa: Should new calls for Biafra worry Nigerians?